The Armory is one of the East Wing additions you can build to expand your home from the Main Hall. The room can have five mannequins, four display cases, and a variety of storage options. Also included is a workbench and grindstone. The Armory, like its counterparts, the Storage Room and Bedrooms, has a large patio area on its roof when completed. This patio can interconnect with the Storage Room's patio if you build it onto your home as well. A few varieties of furniture, as well as lighting, can be added to this exterior area. 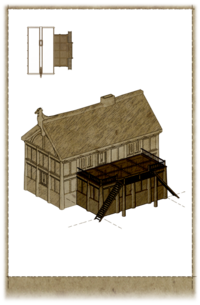 The following is a list of possible furniture items and decorations which can be added by using the carpenter's workbench in the Armory. It is not necessary to purchase or build all furnishing options; you can pick and choose to better dictate style. However, all furnishing options are in a pre-arranged location and only ingredients and standard items can be moved. Oftentimes, the name of the furnishing option only indicates the primary piece of furniture, and actually includes various additional containers and accessories. A number of miscellaneous items are added with various furnishing options, but only notable items are specified on this table. This includes usable containers and rare items. Though they are added to your home, other items and ingredients are not listed here. Chest Sawn Log, Nails, Iron Fittings, 2 Hinge, Lock East wall, south side. Cupboard 2 Sawn Log, 4 Nails, Iron Fittings North side, away from walls. Two cupboards, side-by-side. †Adds a chest to the Containers category. Display Case and Cupboard 2 Sawn Log, 4 Nails, 2 Hinge, Iron Fittings, 2 Glass South side, away from walls, west of center. Display Case and Cupboard 2 Sawn Log, 4 Nails, 2 Hinge, Iron Fittings, 2 Glass South side, away from walls, east of center. Dresser Sawn Log, 3 Nails, Iron Fittings West wall, south side. Dresser Sawn Log, 3 Nails, Iron Fittings West wall, north side. Adds one strong box. Chest † Sawn Log, Nails, Iron Fittings, 2 Hinge, Lock Long chest appears on the top of the cupboard. † This furnishing option only shows up after crafting the Cupboard. Display Case on Low Table 2 Sawn Log, 4 Nails, Hinge, Glass East wall, south of center. End Table with large Display Case. Display Case on Low Table 2 Sawn Log, 4 Nails, Hinge, Glass East wall, north of center. End Table with large Display Case. Round Table Sawn Log, 2 Nails Center of room. Armor Mannequin with Cupboard 3 Sawn Log, 5 Nails, Quarried Stone, Iron Fittings East wall, center. Armor Mannequin with Cupboard 3 Sawn Log, 5 Nails, Quarried Stone, Iron Fittings East wall, south. Armor Mannequin with Cupboard 3 Sawn Log, 5 Nails, Quarried Stone, Iron Fittings South wall, center. Adds small stand with lantern. Armor Mannequin with Cupboard 3 Sawn Log, 5 Nails, Quarried Stone, Iron Fittings East wall, north. Armor Mannequin with Cupboard 3 Sawn Log, 5 Nails, Quarried Stone, Iron Fittings North wall, center. Adds small stand with lantern. Weapon Plaque Sawn Log, Iron Fittings South wall, west side. Includes left and right weapon slots with a central shield slot. Weapon Plaque Sawn Log, Iron Fittings North wall, east side. Includes left and right weapon slots with a central shield slot. Weapon Racks (4) 3 Sawn Log, 4 Iron Fittings South wall, east side. Weapon Racks (4) 3 Sawn Log, 4 Iron Fittings North wall, west side. Archery Targets (2) 2 Leather Strips, Sawn Log, 4 Straw North side, side-by-side. Bench Sawn Log, Nails West side, north of door. Preview shows an intricate bench, actual bench is plain. May not appear, see bugs. Bench Sawn Log, Nails East side, along the rail above the south staircase. Round Table and Chairs (2 Sawn Log, 4 Nails) Does not exist. See bugs. Square Table Sawn Log, 2 Nails South rail. Tanning Rack Leather Strips, Sawn Log Southwest corner. Wall Sconces Iron Fittings, Goat Horns West side, either side of door. Washbasin on Stand Sawn Log, Nails, Iron Ingot West side, south of door. Armorer Workbench Sawn Log, Iron Ingot, 2 Quarried Stone South side, behind "Display Case with Cupboard". Grindstone Sawn Log, Iron Fittings, Quarried Stone North side, behind "Cupboard". Lamp Stand Iron Ingot, 3 Goat Horns West wall, south side. Lamp Stand Iron Ingot, 3 Goat Horns West wall, north side. Mounted Bear Head§ Leather Strips, Bear Pelt East wall, south of center. Mounted Horker Head Leather Strips, 2 Horker Tusk East wall, south side, above chest. Mounted Sabre Cat Head Leather Strips, Sabre Cat Pelt, 2 Sabre Cat Tooth East wall, north side, above tanning rack. Mounted Wolf Head Leather Strips, Wolf Pelt East wall, north of center. Tanning Rack Sawn Log, Leather Strips East wall, north side. Adds one barrel and two sacks. Wall Sconces (2) Iron Fittings, Goat Horns East wall, north side. Wall Sconces (2) Iron Fittings, Goat Horns East wall, south side. §The unofficial patches change the mounted bear head to a mounted cave bear head, requiring the appropriate change in materials. When built, some of the display cases do not offer the option for automatic weapon placement. Weapons (or other objects, if so desired) need to be placed in them manually. This was done intentionally to allow for placing whatever is desired in these cases. Certain exterior items may refuse to generate properly, most commonly the west bench. The Exterior choice of a Round Table and Chairs produces nothing, but the choice is removed from the Exterior list and the materials are lost. Mannequins may randomly lose texture, then subsequently repair themselves. ? Sometimes you may build an item, have it placed, and have it reappear as an item you can build again in the worktable. When selecting this item the second time, your resources are used, but no item is made. When creating Armor Mannequins for the Armory, they will sometimes not be aligned properly. This page was last modified on 2 April 2019, at 04:26.